1834 - 1837 C.BECHTLER. AT RUTHERFORD., around 5 DOLLARS., GEORGIA GOLD: 22. CARATS., around 128.G:, above(), in center, 134.4 grains, Plain Edge, K21. 1834 - 1837 C.BECHTLER. AT RUTHERFORD., around 5 DOLLARS., GEORGIA GOLD. 22. CARATS., around 128.G., above(), in center, 127.6 grains, Plain Edge, K22. 1834 - 1837 C.BECHTLER. AT RUTHERF., around 5 DOLLARS., GEORGIA GOLD. 22. CARATS., around 128.G., above(), in center, 126.6 grains, Plain Edge, K23. 1837 - 1842 BECHTLER. RUTHERF:, $2.50, GEORGIA GOLD. 64.G. above 22. (uneven) CARATS, 63.6 grains, Plain edge, K11. 1837 - 1842 BECHTLER. RUTHERF:, $2.50, GEORGIA GOLD. 64.G. above 22. (even) CARATS, 63.6 grains, Plain edge, K12. 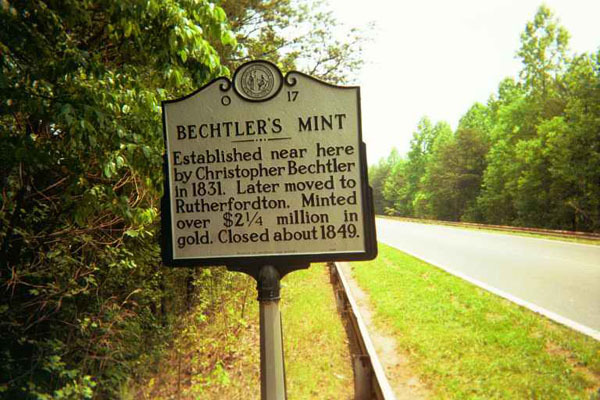 Bechtler coins today are quite scarce and consequently, command high prices when offered for sale. This is especially true of those specimens minted prior to the Coinage Act of June 28, 1834, which increased the value of gold by more than 6%. This caused massive melting of the Bechtler coinage. For anyone interested in viewing these great coins the North Carolina National Bank of Charlotte has the best collection that can be viewed today. The Bechtler coin press can be seen at the American Numismatic Society in New York. Some dies for the coins are in the State Hall of History in Raleigh and the rollers used to shape the ingot strips for cutting into planchets is in the Smithsonian Institute. 1831 - 1834 C. BECHTLER. $1, RUTHERF:30 G.; N: CAROLINA GOLD Reeded Edge 29.8 grains K-1. 1831 - 1834 C. BECHTLER. ASSAYER, $2.50, RUTHERFORD; NORTH CAROLINA GOLD. 250. ABOVE 20.C. spread out, 71.8 grains, Reeded edge, K5. 1831 - 1834 C. BECHTLER. ASSAYER, $2.50, RUTHERFORD; NORTH CAROLINA GOLD. 250. ABOVE 20.C. close, 72.1 grains, Reeded edge, K6. 1831 - 1834 C. BECHTLER. ASSAYER, $2.50, RUTHERFORD; NORTH CAROLINA GOLD. 250. ABOVE 20.C. close, no 75.G, 73.3 grains, Reeded edge, K7. 1831 - 1834 C. BECHTLER. ASSAYER, $2.50, RUTHERFORD; NORTH CAROLINA GOLD. 250. ABOVE 20.C. close, 75.G under 20.C, 73.8 grains, Reeded edge, K8. 1831 - 1834 C. BECHTLER. ASSAYER, $2.50, * 75G; NORTH CAROLINA GOLD. 250. ABOVE 20.C. close, no 75.G, 73.3 grains, Reeded edge, K9. 1831 - 1834 C. BECHTLER. ASSAYER., $5, RUTHERFORD COUNTY. ; NORTH CAROLINA GOLD., 5 DOLLARS. above 20.CARATS., 148.9 grains, Reeded edge, K14. 1831 - 1834 C. BECHTLER. ASSAYER., $5, RUTHERFORD COUNTY. ; NORTH CAROLINA GOLD., 5 DOLLARS. above 20.CARATS.above 150.G., 148.9 grains, Reeded edge, K15. 1834 - 1837 C. BECHTLER. $1, RUTHERF:28 G. High in field; N: CAROLINA GOLD Reeded Edge 27.6 grains; K-2. 1834 - 1837 C: BECHTLER. $1, RUTHERF:28 G. Centered in field; N: CAROLINA GOLD Plain Edge 27.6 grains; K-3. 1834 - 1837 BECHTLER. RUTHERF:, $2.50, CAROLINA GOLD. 67.G. above 21.CARATS, 66.5 grains, Plain edge, K10. 1834 - 1837 *C:BECHTLER. AT RUTHERFORD, around 5 DOLLARS., CAROLINA GOLD.CARATS, with AUGUST 1, 1834., then 140.G.20 in center, 137.5 grains, Reeded Edge, K16. 1834 - 1837 *C.BECHTLER. AT RUTHERFORD. (periods), around 5 DOLLARS., CAROLINA GOLD.CARATS, with AUGUST 1, 1834., then 140.G.20 in center, 139.8 grains, Plain Edge, K17. 1834 - 1837 *C:BECHTLER. AT RUTHERF:, around 5 DOLLARS., CAROLINA GOLD.CARATS, with AUGUST 1, 1834., then 140.G.20 in center, Plain Edge, K18. 1834 - 1837 *C:BECHTLER. AT RUTHERF:, around 5 DOLLARS., CAROLINA GOLD.CARATS, with AUGUST 1, 1834., then 140.G.20 away from CARATS in center, 137.7 grains, Plain Edge, K19. 1834 - 1837 C:BECHTLER. AT RUTHERF:, around 5 DOLLARS., CAROLINA GOLD.21 CARATS., around 134.G. *, in center, 134.4 grains, Plain Edge, K20. 1834 - 1837 C.BECHTLER. AT RUTHERFORD., around 5 DOLLARS., GEORGIA GOLD:22. CARATS., around 128.G:, above(), in center, 134.4 grains, Plain Edge, K21. 1834 - 1837 C.BECHTLER. AT RUTHERFORD., around 5 DOLLARS., GEORGIA GOLD.22. CARATS., around 128.G., above(), in center, 127.6 grains, Plain Edge, K22. 1834 - 1837 C.BECHTLER. AT RUTHERF., around 5 DOLLARS., GEORGIA GOLD.22. CARATS., around 128.G., above(), in center, 126.6 grains, Plain Edge, K23. 1837 - 1842 BECHTLER. $1, RUTHERF:28: G: Centered in field; *CAROLINA GOLD, O(N)E reversed, Plain Edge 27.6 grains; K-4. 1837 - 1842 BECHTLER. RUTHERF: $2.50, CAROLINA GOLD. 67.G. above 21.CARATS, 66.5 grains, Plain edge, K10. 1842 - 1850 A. BECHTLER. ($1) DOL:, CAROLINA GOLD., 21.C:, Plain Edge, 21.8 grains; K-24. 1842 - 1850 A. BECHTLER. ($1) DOL:, CAROLINA GOLD., 21.C:, Reeded Edge, 21.8 grains; K-25. 1842 - 1850 C:BECHTLER. AT RUTHERF:, around 5 DOLLARS., CAROLINA GOLD.CARATS, with 134.G:21. in center, Reeded Edge, K26, Unique. 1842 - 1850 A.BECHTLER. RUTHERFORD. *, around 5 DOLLARS., CAROLINA GOLD.CARATS, with 134.G:21. in center, Reeded Edge, 133.7 grains, K27. 1842 - 1850 A.BECHTLER. RUTHERFORD. *, around 5 DOLLARS., CAROLINA GOLD.CARATS, with 128.G:22. in center, Reeded Edge, 126.7 grains, K28. 1842 - 1850 A.BECHTLER. RUTHERFORD. *, around 5 DOLLARS., CAROLINA GOLD.CARATS, with 141.G:20. in center, Reeded Edge, 138.8 grains, K29. A.BECHTLER. RUTHERFORD. *, around 5 DOLLARS., CAROLINA GOLD.CARATS, with 141.G:20. in center, Plain Edge, 138.8 grains, K30, Chapman Restrike 1908. C. BECHTLER. RUTHERF:*, around 5 DOLLARS., CAROLINA GOLD.CARATS, with 141.G:20. in center, Plain Edge, 138.8 grains, K31, Chapman Restrike 1908.